[NEW YORK] Job-hunting teenagers in cities across the United States face the third bleak summer in a row. They must compete for scarce slots in scaled-back government work programmes and against adults forced into low-paying positions by the unemployment crisis. Teens - often the last hired and first fired - suffered the toughest summers on the job front since World War II in 2010 and 2011. This summer, the outlook is chilly - again. In April, the US unemployment rate for 16- to 19-year-olds was 24.9 per cent - and much higher in some metropolitan areas. Los Angeles - with the help of federal stimulus money - created around 15,000 summer jobs for teenagers in 2009 and 2010. But as the federal programme ended, that was slashed to about 6,000 in 2011. It will not rise this year. It's a similar story in other major cities. New York City had 52,000 summer jobs for teens in 2009. Now the programme is half that size. It has five applicants for every job. Boston hopes to get funds and private-sector placements to raise this summer's teen job program to 10,000 slots, up from 8,800 in 2011, said Conny Doty, director of the Mayor's Office of Jobs and Community Services. The Obama administration's stimulus funding helped support more than 370,000 summer youth jobs in 2009 and 2010. But last autumn, a divided Congress failed to enact another jobs measure, which included US$1.5 billion for summer and year-round jobs for low-income teenagers and young adults. 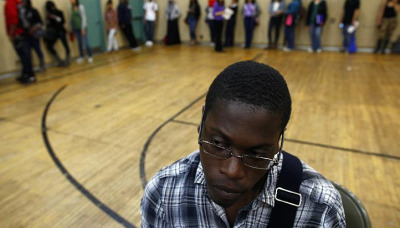 Brandon Hutchinson, 17, in line with about 200 other teens waiting to register for New York City's summer job programme, said he has made it through the job lottery two out of the three times he applied. In the lottery, though, not all who are called are chosen. To land a summer job, each teen must bring documents showing proof of identity and family income. Some economists say the lack of job opportunities could push some urban teens to permanently disconnect from the workforce. "If you're a lower-income person, the income might be pretty valuable. If it does keep you out of trouble, that's valuable because once young people are incarcerated, they are scarred for life," said Harry Holzer, a professor at Georgetown University's Public Policy Institute. The poorest Americans bear the brunt of the teen job crisis. Only one of every five teenagers whose family had income below US$20,000 a year was hired last summer, a report by Northeastern University's Center for Labour Market Studies found.